Scooper - Technology News: Is this the beginning of the end for fossil fuels? Is this the beginning of the end for fossil fuels? There has never been a better time to break free from fossil fuels. Record-breaking global temperatures, plummeting fossil-fuel prices, historic investments in renewable energy, and global pressure to honor climate pledges are all coming together to create the ideal setting for this world-changing shift. The shift could not be more urgent. The United Nations climate agreement forged in Paris last December reconfirmed the level of 2°C above pre-industrial levels as a hard upper limit for global warming, beyond which the consequences for the planet become catastrophic. But it also included commitments to “pursue efforts” to limit warming to 1.5°C. Judging by the latest data published by NASA, achieving that lower limit should be viewed as an imperative. The new data confirm that 2015 was the hottest year on record, and show that the global run of record-breaking temperatures continued through the first two months of this year. 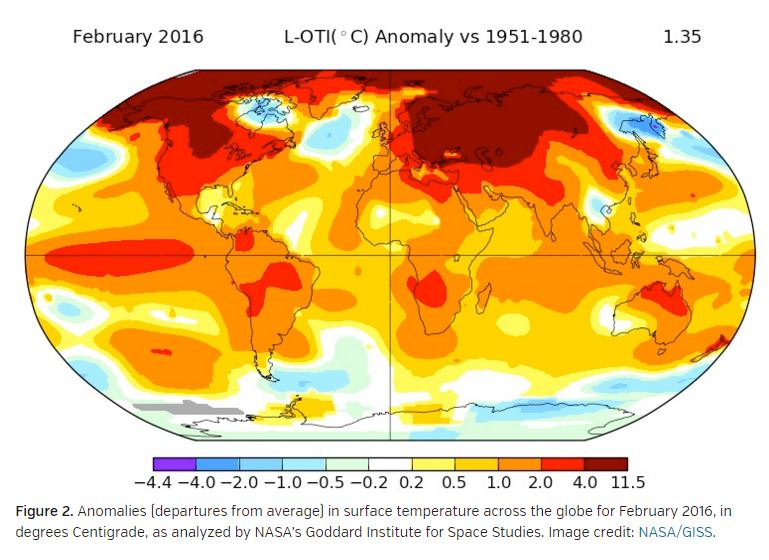 According to NASA, global temperatures in February were 1.35°C above average , based on a 1951-1980 baseline. Fortunately, the privileged position of fossil fuels already seems to be weakening. In fact, according to the International Energy Agency (IEA), global greenhouse-gas emissions and economic growth have already decoupled , with global energy-related CO2 (the largest source of human greenhouse-gas emissions) having remained at the same level for the second year in a row. This means that fossil fuels are no longer the lifeblood of our economy. It seems that the precipitous decline in oil prices – by two-thirds over the last 18 months – has not, as many feared, encouraged increased consumption. What it has done is deal a major blow to the profits of fossil-fuel giants like Shell, BP, and Statoil. Coal is not faring any better. Following China’s announced moratorium on new coal-fired power plants at the end of last year, Peabody, the world’s largest coal company, recently filed for bankruptcy protection in the US, after it could no longer make its debt payments, partly because of waning demand for coal. Meanwhile, renewable energy sources are receiving record amounts of investment – some $329.3 billion last year, according to research from Bloomberg New Energy Finance. As a result, a cleaner, fairer, and more sustainable future, powered entirely by renewables, is starting to become a real option. Yet there is still a long way to go. Most governments are still clinging, to varying degrees, to destructive fossil fuels, with their volatile prices and devastating environmental impact, even as this dependence destabilizes their economies. Those committed to addressing climate change – from international organizations to local communities to individual citizens – must urgently build on the momentum acquired over the last year, by maintaining strong pressure on governments and companies to pursue the policies and investments needed to complete the break from fossil fuels. Just as a warming planet puts us all at risk, scaling up action early benefits everyone. And it is up to everyone to hold leaders accountable to their promises, and to science. Global movements such as Break Free have been exemplary in this regard. By backing campaigns and mass actions aimed at stopping the world’s most dangerous fossil-fuel projects – from coal plants in Turkey and the Philippines, to mines in Germany and Australia, to fracking in Brazil, and oil wells in Nigeria – Break Free hopes to eliminate the power and pollution of the fossil-fuel industry, and propel the world toward a sustainable future. Recognizing the scale and urgency of the challenge ahead, Break Free is prepared to intensify its peaceful resistance against new and existing fossil-fuel projects. The key will be the strength and bravery of communities demanding that we keep fossil fuels in the ground and instead build a healthier and more just world, in which everyone has access to sustainable energy. The world is closing in on a historic shift in our energy system. To accelerate progress, we must confront those who are profiting from climate change and defend the interests of ordinary people. Next month’s mobilizations against fossil-fuel projects are an important step in the right direction. The struggle finally to break free from fossil fuels is a global one. Nobody can afford to ignore it.